New Therapies for Asthma: What Else Besides Steroids? 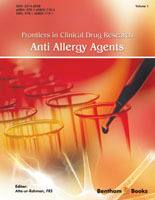 Frontiers in Clinical Drug Research - Anti-Allergy Agents is an exciting eBook series comprising a selection of chapters relevant to the development of pharmacological agents used for the treatment of allergies. The contributions by leading researchers in the field shed light on new therapies for allergic reactions, nutrition based therapies and the use of substances such as omalizumab and adrenaline to counter inflammatory response and anaphylaxis in patients. The scope of the chapters includes clinical trials of anti-inflammatory and anti-allergic drugs, drug delivery strategies used to treat specific allergies (such as inflammation, asthma and dermatological allergies), lifestyle dependent modes of therapies and the immunological or metabolic mechanisms that are of interest to researchers as targets for new drugs. In the first chapter, Sedef Bayata and Aylin Turel Ermertcan have discussed the mechanism of action, efficacy, safety, adverse effects of topical calcineurin inhibitors and their innovative use in dermatology. In chapter two, Jorge Sánchez and Javier Estarita present the biological agents available for the treatment of asthma and other allergic diseases such as omalizumab (Anti-IgE) and mepolizumab (Anti-IL5). The different monoclonal antibodies that are being studied in allergic disease with emphasis on the evidence of their use in asthma is also reviewed. Mariana Couto et al. demonstrate the hypersensitivity disorder problems for both recreational and competitive athletes such as asthma in the next chapter. In chapter four Martinez-Tadeo et al. have discussed the use of omalizumab therapy for allergic diseases such as asthma of occupational origin, seasonal or perennial allergic rhinitis, and chronic urticaria. Sagar Laxman Kale and Naveen Arora provide a comprehensive overview of different therapeutic approaches for the management of allergic diseases which include allergen avoidance, pharmacotherapy and allergen specific immunotherapy (SIT) in chapter 5. Food allergies have been increasing in prevalence over the last 10 years. In chapter six, Marina Pérez-Gordo et al. have discussed a number of promising emerging therapeutic modalities for food allergy, including allergen-specific and allergen non-specific immunotherapeutic approaches. In chapter seven, Neena Philips et al. present the pathophysiology of several diseases, including allergy and asthma, which is linked to increased reactive oxygen or nitrogen species and inflammatory cytokines. They also discuss inflammatory and oxidative processes consisting of the breakdown of membrane lipids to generate important inflammatory mediators (prostaglandins, platelet activating factor) that activate immune cells, degranulate eosinophils, and mediate vascular alterations. Jianli Zhao have reviewed the recent developments regarding adiponectin and estrogen in the context of allergic pathology, encompassing asthma, allergic rhinitis, and immune system components pertaining to inflammation in chapter eight. They have also discussed anti-inflammatory mechanisms underlying nontraditional pathways of these proteins, including adiponectin’s AMPKindependent signaling pathway and estrogen’s effects via its membrane receptor. In the last chapter by Miguel A. Tejedor-Alonso et al. a comprehensive review is presented of the use of epinephrine in anaphylaxis episodes both by patients and by the emergency services. I hope that the readers will find these reviews valuable and thought provoking so that they trigger further research in the quest for the development of pharmacological agents used for the treatment of allergies. I am grateful for the timely efforts made by the editorial personnel, especially Mahmood Alam (Director Publications), Taimur A. Khan and Maria Baig at Bentham Science Publishers. Centro Hospitalar São João, E.P.E.